Shooting Sports with a Camcorder – One of the most challenging tasks when using a camcorder is shooting sports videos and sporting events. Many outdoor action sports are fast moving (football, lacrosse, soccer). Most outdoor sports are in good lighting conditions, although bright sun can cause challenges. Indoor sports, such as basketball are also fast moving, but lighting can be poor depending on the location. In this article we will attempt to guide you through the different conditions that you may encounter, how to shoot video in those conditions, and which camcorder is best suited for the sport(s) you are going to shoot. For all sports, we recommend a high definition or a 4K Ultra HD camcorder, as this is now the standard in camcorders now and into the future. Shooting Outdoor Sports Video – For outdoor sports and events you have a wider variety of camcorders you can use, since lighting conditions are usually good to excellent. A camcorder with a long zoom lens is preferable, 10x optical zoom or more. Some camcorders state they have 50x (digital) zoom, but you must look at the optical zoom only. Optical zoom is what the actual lenses of the camcorder can resolve. Digital zoom magnifies the current video, but does not offer additional details in the picture, so you lose detail. Try to get close to the action, as zoom lenses have their limitations, and try to film at different locations and angles for variety and a more interesting video. Shooting Indoor Sports Video – Shooting indoor sports and events can be challenging because lighting conditions can be anywhere from good to dim. The number one complaint of most camcorder users are camcorders that shoot poor video in low light. Fortunately, recent models have improved their sensors and lenses to be better in low light conditions. Most of the advice for shooting outdoor sports, also applies to indoor sports. If you use the zoom lens indoors, keep in mind that less light will reach your camcorder’s imaging sensor when you are zoomed in. So for best light sensitivity, its best to use the zoom as little as possible. Try to get closer to the action without getting in the way. Very Bright Sun – Sunny days may be pleasant, but produce challenging video shooting conditions compared to an overcast day. With bright sun, white shirts can have what is called blown out highlights. In other words the brightness eliminates the details that are on the bright subject. What can you do? If its late in the day, try and shoot the video with the sun to your back, as shooting with the sun in front of you can produce lens glare. There are also filters that you can put on your camcorder that will help. A neutral density filter can help in very bright conditions and bring exposure control into the middle of its range. Use a Lens Hood if available on your camcorder to reduce lens flare when shooting toward the sun. Use of the Zoom Lens – A zoom lens can bring the action in closer, but it also narrows your field of view. So instead of a view of most of the field, only a small part of the field is in view. Many sports are fast action. As such when you move the camcorder, your movements can be exaggerated and jerky when you are at full zoom. One of the biggest mistakes camcorder users make is to keep their lens zoomed in. We have all seen amateur video with wildly jerky movements and out of focused blurred subjects. The user forgets to zoom back out. Use the zoom sparingly. Its best to use zoom when there is not a lot of movement on the field where you can zoom in and stay with the subject you are filming. As mentioned above, when you are using the full zoom, light to the camcorder sensor is reduced, which can be a problem in low light conditions. Get closer to the field if possible instead of using the zoom. Never try to follow the ball or puck zoomed in, as your video will be jerky and blurry. Camcorder Sound – One of the most neglected aspects of camcorders is paying attention to the sound quality of your videos. All camcorders have built-in microphones. These built-in microphones vary in quality, and some can give you decent stereo audio. The biggest problem is when you are outdoors and dealing with wind noise. Most built-in microphones do poorly in the wind and it knocks out most of the ambient game sounds that you want to record. One solution is to get a camcorder that can take an external microphone (usually mounted on the top of the camcorder). You plug this into a microphone jack if your camcorder supports this. These microphones usually have a foam sleeve to cut down on wind noise. But even foam is not always sufficient to cut out all wind noise. The best wind noise killer is called a “deadcat”. News crews use these when shooting outdoors. It looks like a furry sleeve which fits over their microphone. This cuts almost all the wind noise. You can purchase “deadcats” for your external microphone online. Pan Camcorder Slowly – Another mistake many people make is moving the camcorder too fast when panning (moving the camera horizontally). Pan your camcorder slowly across the field. Otherwise the video can become blurry, jerky, and hard to see what is going on. If you are close to the action, hold your camcorder steady and let the action pass you by without moving. Keep the Camcorder Steady – Another problem that can lead to jerky video is that many people do not hold their camcorder steady. When moving the camcorder when filming, hold it steady, pan slowly, and try and brace yourself to hold the camcorder steady. Fortunately, today’s camcorders have built-in optical image stabilization which will help compensate for minor shakes and bumps. You can also use a tripod or monopod to keep the camcorder steady. Additional Video Footage – Take footage of the cheerleaders and the crowd in the stands to add to your edited video. This can add to the drama and excitement of the sporting event. Vary your shots from closeups of faces to wide angle shots of the whole field and crowd. Interview players after the game (if possible). Image Stabilization – Image stabilization compensates for image shake that occurs when you are holding a camcorder in your hand. Image stabilization is critical for sports video, since you many times will be zooming in on the action, which makes camera shake even more apparent. Sony has introduced a new type of image stabilization that isolates the entire lens assembly and claims to be 13x better than normal image stabilization. It is called Balanced Optical Steadyshot image stabilization. The sample footage we have seen is extremely impressive and would be of enormous help with shooting video of sports. This is a major breakthrough in stabilization technology. A professional steadicam is how most professionals try to smooth out the video when shooting sports. This new type of stabilization may be able to replace the steadicam for some applications. Click on the video on the left for impressive footage of this technology in use. See the comparison footage near the end of the video. Touch & Track Feature – Some of the newest camcorders have helped assist in the filming of sports. A new feature that is in several camcorders allows you to use the LCD screen to touch on the screen the subject you want to track. Once touched the camera locks onto the subject and follows its movements, while keeping it in proper focus and exposure. The highly rated Sony Handycam FDR-AX700 , the Canon Vixia HF G21 and the Canon XA30 Pro all have the Touch and Track feature and are great camcorders for sports video. Viewfinder – Many of the newer inexpensive camcorders do not have a viewfinder. Most people use the large LCD display to frame their videos. A viewfinder may be useful in sunny conditions where the LCD screen may get washed out and difficult to see. A few high end models still have a viewfinder. Face Detection – Many camcorders have a feature called face detection. What this feature does is to automatically detect people’s faces in the video and adjust exposure so that the faces are bright and easy to see. Higher framerates – Many modern camcorders can record full HD at a higher 60fps rate, which will give a smoother picture for fast moving action, than the lower 24 and 30fps. The only downside is that it takes more room to store on your memory card, and can be dimmer in low light situations. Some camcorders have 120fps, which is good for slow motion video, which would be nice to slow down the action, say in a football game. 4K Ultra HD Camcorders – New on the scene are 4K Camcorders. These camcorders can shoot video at about the same resolution as the 4K projectors at your local movie theater. With the advent of 4K TVs, this will give you 4 times the resolution of HD for super clear videos. This will future proof the videos you shoot today to work on future 4K TVs that will become the standard in the future. More detail will allow you to see the faces of the players even if zoomed out. Editing your Videos – Showing your entire video of what you have shot can have many dull moments. By editing your video, you can put together the hilights and shorten the video so that its fun and engaging to watch. Popular video editing programs such as Adobe Premiere Elements can produce excellent seamless videos. We highly recommend that you edit your videos for best presentation. Editing high definition video will require a fast computer with lots of memory. Environmental Problems – Condensation is a major problem when going from your air conditioned car or home to a humid hot outside environment. This will cause moisture on your lens and possibly damage your camcorder over time. One solution is to put your camcorder in a ziploc type bag (the smallest one that fits your camcorder). Leave your camcorder in the bag when outdoors until the camcorder has warmed up to the outside temperature (20-30 minutes). When you remove the camcorder it will not cloud up the lens as the lens is now at the same temperature as the outside environment. Keep your camcorder out of the rain. Carry a waterproof bag and cloth to wipe it off should it start raining. In cold conditions, battery life will be reduced. You may want to keep batteries in a warm pocket before shooting in cold environments. Panasonic’s HD Camcorders with Twin Camera: Panasonic has produced the only camcorder available with a Second Twin Camera. 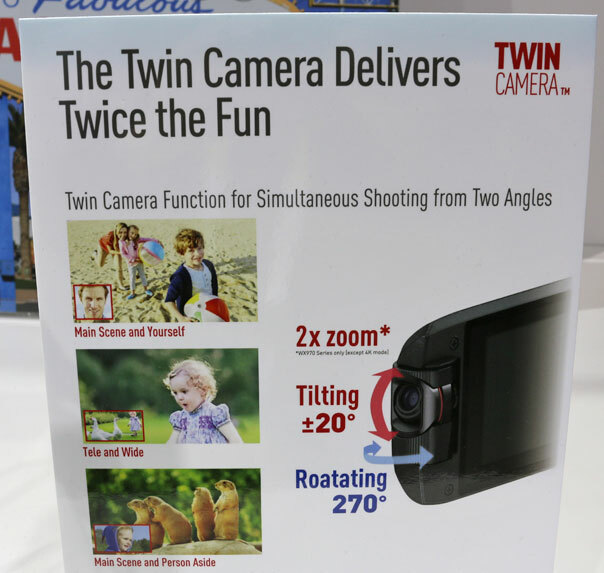 This will allow you to film someone with the main camera, and a second twin camera mounted on the LCD door will allow you to get a wide angle shot of the entire playing field. Or you could record yourself reacting to the sports event. The second camera view shows as a small window in the corner of the video. So you can get video of both the main subject and a second view. The newer WXF991 is a 4K Ultra HD camcorder and records the second video stream to a separate file. DSLR Camera Vs. Camcorder for Sports – A camcorder is usually the superior option for fast moving unpredictable shooting of video of sporting events. The Camcorder has a powered zoom with image stabilization which makes it easier to use. DSLRs have a larger imaging sensor which creates a shallower depth of field, and for fast moving sports, you want a wider depth of field to keep things in focus. Panning horizontally with a DSLR can create rolling shutter artifacts. Some DSLRs have a limit on the length of the video clip they can record.